Pressed glass, which dates to the late 19th century, made glassware affordable to middle class people who lacked the money for fine crystal. Mass produced in a wide variety of shapes and patterns, pressed glass was sometimes dismissed as disposable because it was inexpensive. However, its variety and affordability has lead the glassware to become popular with collectors. Pressed glass is widely available at antiques and collectibles stores, online, and at garage and estate sales. To pick out the best pieces and recognize specific patterns, a collector needs to do some research. Look at patterns in collectors’ guides. These guides contain detailed information, including pictures of specific patterns you can use to match to your pieces. Check for pressed glass guidebooks at your local library and bookstore, or look on Amazon.com or eBay. Some useful guides include “Standard Encyclopedia of Pressed Glass” (sixth edition) by Bill Edwards, “The Collector's Encyclopedia of Pattern Glass” by Mollie Helen McCain and “Early American Pressed Glass: A Classification of Patterns Collectible in Sets Together With Individual Pieces for Table Decorations” by Ruth Webb Lee. Consult china replacement services. If you know the manufacturer of your piece, you can search for that company's patterns at a china replacement service, such as Replacements, Ltd. This website shows pictures of thousands of patterns, enabling you to hunt for the one you own. If the manufacturer made many patterns, however, this can be a tedious process. If you need help, Replacements, Ltd. offers an identification service if you send a picture of your piece directly to the company. Get help from other collectors. Fellow pressed glass collectors can be useful sources of information when trying to identify different patterns. The National Glass Fair's website includes links to various glass collecting organizations in both the United States and the United Kingdom. Compare your glass to antique store inventories. Studying the inventory at local antique stores that specialize in glassware can help you familiarize yourself with, and learn to identify, different patterns of pressed glass. Looking at what is for sale at online stores is useful as well. 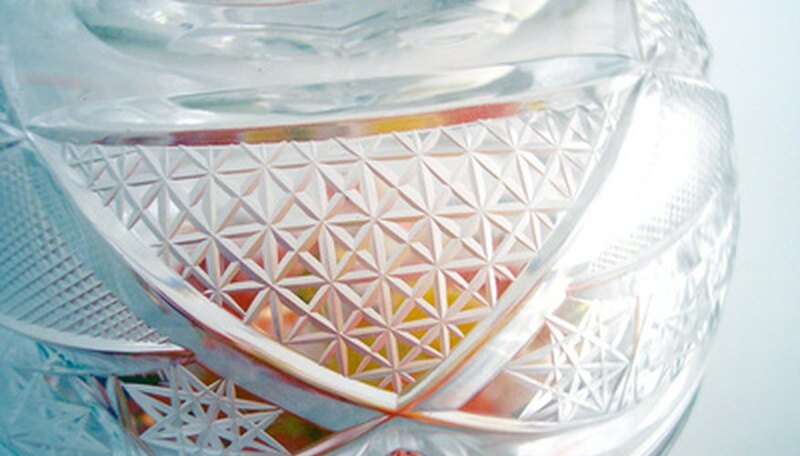 Websites such as Trocadero, My Granny’s Attic and eBay offer a large selection of pressed glass patterns. Get a professional appraisal. If you have a large collection, you may want to consider paying an appraiser to tell you what patterns you own and how valuable they are. To find a professional who specializes in glassware, consult The American Society of Appraisers or The International Society of Appraisers.